How StomaCloak can help provide comfort and confidence when you have a stoma appliance. If you have a stoma or have worn a ostomy appliance, you know the cold moist feeling of the plastic after perspiration or after showering. The scrunchy sound of the plastic against the plastic that it makes with movement is a sound you know; adding to your insecurity. You have felt the cold moisture against your abdomen, leg, and groin particularly in cold weather, even if it is not wet. The cold plastic even wakes you up at night as it brushes against your lower abdomen. You may be self-conscious in public, prompting you to keep checking the area with your hand, wondering if the wetness you feel is due to a leak and wonder if it is getting wetter, or if you just maybe didn’t dry the bag well enough after your shower. Are those around you aware of the odors, you wonder. You wonder uncomfortably. It is because of you that we produced the Stoma Cloak. We designed StomaCloak with the active person in mind. Ostomates trying to have a normal life love the soft texture of the material as opposed to the sweaty cold plastic texture of their appliance bag. The wicking properties of the StomaCloak keep the skin dry under the ostomy appliance, even when perspiring. After showering, instead of the moist feeling of the wet appliance against the abdomen that generates a fear of leakage, the StomaCloak feels warm, dry and comfortable. 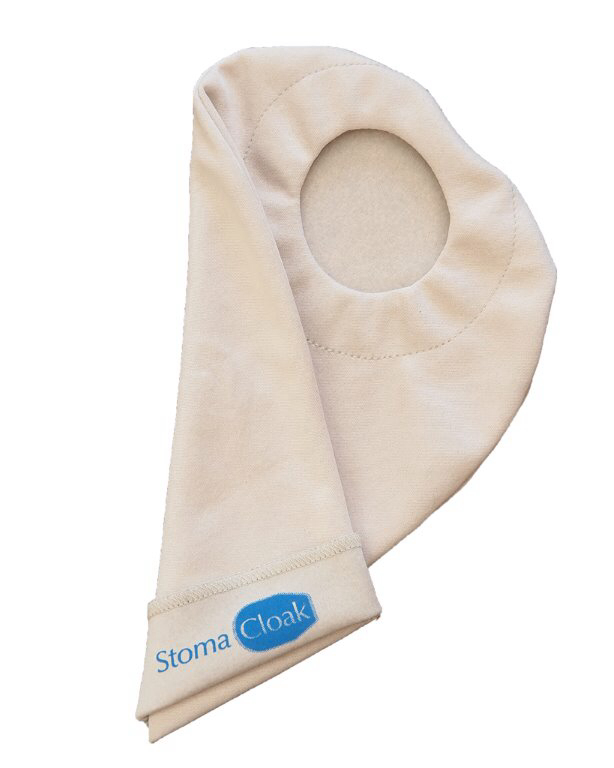 As the name “Cloak” implies, it conceals the stoma appliance. The activated carbon adsorbs odors; the undergarment-type material muffles the plastic scrunchy sounds; the opaque material hides the device from view. StomaCloak is made of a durable yet soft material. After use for 3-4 days, simply wash it in a standard washer with your underwear. It is supercharged with carbon that is reactivated and ready to adsorb odor molecules after drying at the heat setting. Tuck it into your underwear drawer and it will remain ready to do its deodorizing magic for two weeks. We recommend having three StomaCloaks on hand so that one is in place on your ostomy appliance, one is in the laundry, and one is in your drawer ready to go!